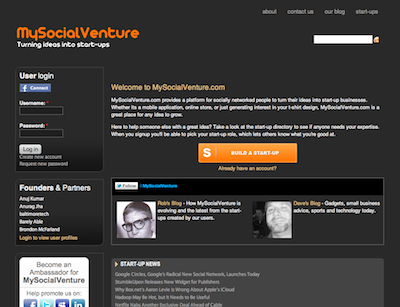 MySocialVenture.com provides a platform for socially networked people to turn their ideas into start-up businesses. Whether its a mobile application, online store, or just generating interest in your t-shirt design, MySocialVenture.com is a great place for any idea to grow. Unlike competitors who charge to place people’s ideas with partners and investors, we provide an open platform with an open marketing model. Previous post: IsHostedBy.com – Who is Hosting That Website?